Great Balls of Fire is a bright new creation bubbling with huge potential which just needs some tweaks or reworking here and there to make the script as zingy as the music. Jonathan Roxmouth once said the best advice he’d been given was to use downtime in the dressing room to write material for himself. Not to wait for the next opportunity to come along, but to craft it for himself. It’s advice he’s followed for years, so in between playing big-hitting roles like Che in Evita, The Phantom of The Opera and Sweeney Todd in that eponymous musical, he’s written and performed his own material too. Often those are small, intimate shows like Call Me Lee and I’m Playing Your Song. Now he’s come up with a far more ambitious venture – the full-on musical Great Balls of Fire. 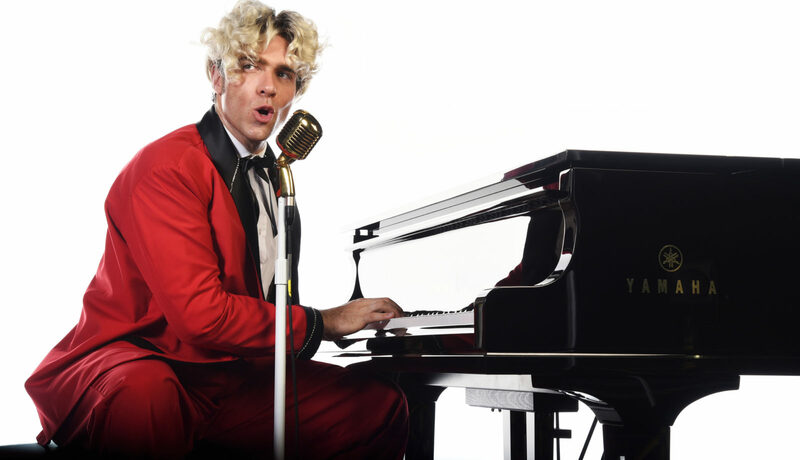 Penned in partnership with Weslee Swain Lauder, it’s the story of Jerry Lee Lewis and his rise from church pianist to a hell-raising, child-marrying, booze and pill-popping rock & roll reprobate. Sounds fun, hey! 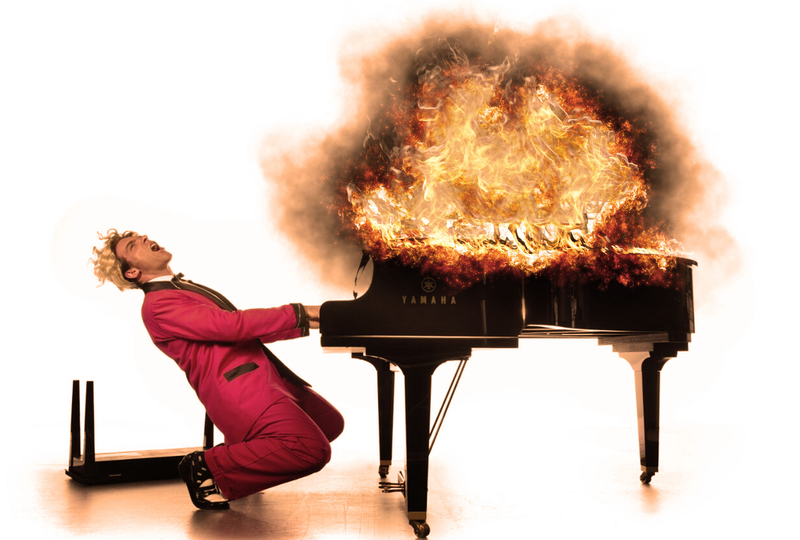 Yet the show doesn’t entirely satisfy, even though Roxmouth is the perfect three-in-one package: a superb pianist, fabulous singer and convincing actor. He pounds out the Lewis tunes with hands a-blur, sings with fiery intensity and transitions his character from the good kid with a wild side to a wild man who’s lost his way. A full cast around him forms the band and plays the other characters, chief among them Michael Richard as his father Elmo and Craig Urbani as record producer Sam Phillips. Richard plays his curmudgeonly father beautifully, full of gruff bluster but steadfast and supportive as a rock. Urbani is as smooth and suave as ever, his powerful stage presence capturing the days when recording moguls were demigods. The tale is built around Lewis returning home and talking to his pastor, voiced by Harry Sideropoulos. A recorded voice from above isn’t a theatrical tactic I’m in love with. It serves the purpose, but feels stagey and stilted in a show otherwise ablaze with energy. The two halves are also a little mismatched, with the first full of upbeat banter and songs as he heads for fame. The second half takes a more dramatic turn as self-destructive choices turn fate against him, and some of the dialogue could do with extra polish to make it flow more naturally. The stage set by Nadine Minnaar is delightful, with panels that swing to turn a church into a bar or recording studio, and a bridge that adds height and expansiveness to elevate us beyond the confines of the stage. Vivid costumes are a swirl of style and colour, from church house poor to stage-struck gaudy, capturing the era as well as the excesses. Much of the music was new to me, except for Great Balls of Fire and Whole Lotta Shakin’ Goin’ On. That doesn’t really matter, since anything Roxmouth plays is eminently watchable, and there’s some cute choreography as he sings Breathless in a duet with Ashleigh Harvey as his under-age cousin Myra. Roxmouth and Lauder have thoroughly researched the history of the farm boy who became a flamboyant performer, and the mercurial ups and downs of his life would have any storyteller salivating. The script captures some of those details through the action and in conversations that could have happened, makes nice use of historic radio clips or recreations from newspapers, and lobs in more facts in passing. Given the audaciousness of the central character, it doesn’t sparkle as brightly as it should, however, and some words were lost beneath the music or in thick Southern drawls. Great Balls of Fire runs at Montecasino Theatre until August 12. Tickets from Computicket or the Box Office on 011-511-1818.